Flour comes in two basic categories – wheat-based and non-wheat based, and within those two categories there is a sometimes bewildering range of options. Here’s a handy guide to help you decide which flour to use. Wholemeal flour may also be labelled wholewheat or wholegrain and it is made from the complete wheat kernel which means it is higher in fibre and has a better nutrient content than white or brown flours. However, it doesn’t have as much gluten because of the bran, which means that it is often mixed with other flours to give it more elasticity when cooking. 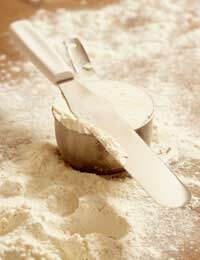 Plain flour is good for most forms of cooking but may need to be mixed with ‘soft’ flour for cakes. It is great for biscuits and sauces though. Self-raising flour always contains a raising agent, usually baking powder – it’s used for cakes, scones and sweet puddings. Strong flour is used for breads, Yorkshire pudding and making puff and choux pastries. Malted wheatgrain or wheatgerm flour is either brown or wholemeal flour with additional malted grains that give a nutty flavour and texture to the final product. It is usually used for breadmaking. Stoneground flour is simply wholemeal flour ground between two stones in a traditional milling fashion. Flours which are not derived from wheat may or may not contain gluten. Gluten allergies are becoming more commonplace and using non-wheat flours allows the gluten intolerant to enjoy baked goods. Some flours also work better for specific dishes than wheat. Corn meal is a coarsely ground corn flour that is used for making corn bread and tortillas, when finely ground it is called cornflour and used to make sauces. Chestnut flour is sweet and has a beige or grey colour – it’s used for making sweet dishes and may be mixed with wheat flour. Buckwheat flour has a nutty flavour and is speckled with black fragments – it’s ideal for those who have gluten allergies but may often be mixed with other flours to reduce its bitter aftertaste. Rice flour is also gluten-free and is a frequent ingredient in Southern Indian and South Asian cuisine. White flour can be kept in a cupboard or pantry for up to eight months in a sealed container. Wholemeal flour keeps for only four months in a cupboard, not matter how tightly sealed, and for up to a year in a freezer if in a tightly-sealed plastic container. This is because the wheatgerm has a high oil content and it may become rancid if kept in a cupboard where temperatures are not low enough to stabilise the oils. If you store flour near granular detergents, onions or other strongly-scented items it may pick up a taint. On the other hand, you can put a dried bay leaf in the box with the flour to prevent infections because bay leaves are highly insect repellent - the flour will not be scented by a dried leaf although it may by a fresh one.